Toolboxes are plentiful at garage sales--I simply planted in the bottom of this cheery, bright yellow one. 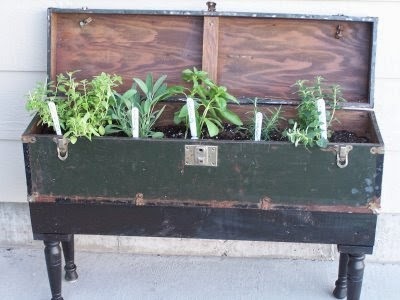 Attach a stray drawer to a twin headboard to make a fantastic flower bed. An old tin coffee pot and ice cream can make perfect planters. Plant some sweet pansies in a pair of old boots--I used rain boots but cowboy boots or work boots work too! There are so many more great "planters" at thrift stores--mixing bowls with the mixer, canisters, china teacups, wood boxes, old suitcases, nightstands, baby bassinets. What creative items have you planted in? Linking up with sweet Donna at Funky Junk Interiors!! 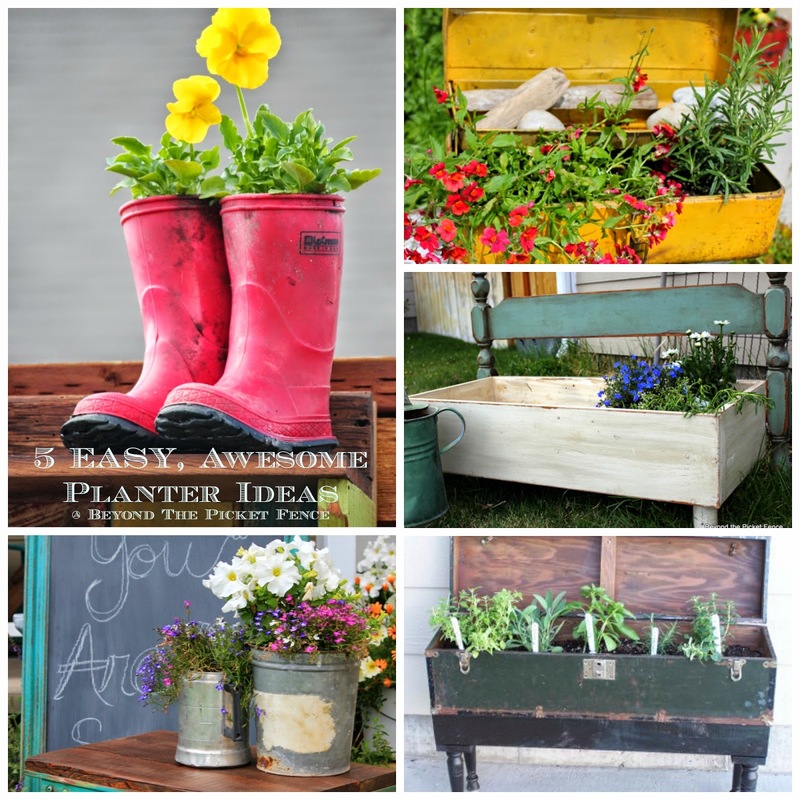 Junk makes the best flower planters! Great ideas!!! I pove the boots!!! Love the base you created for the tool box...what a great idea! It's about to snow where we are on Colorado so I'm with you on this "arctic" nonsense. Hurry up, summer!! :) Thanks for sharing and Happy Mother's Day to you!! All great ideas and I love those little red boots! I'm right there with ya on the wait, itching for warmer weather to arrive and stay here in Michigan. The girls got me flowers today and I'm going to dig in the garage later this week to see what I can round up for planters. LOVE your gold tool box, what a gem!